This past weekend saw the annual OpenStreetMap “State of the Map” conference arrive in Girona, Spain. I attended for the fourth year running and was glad to be given the opportunity to talk about mapme.at, what it is and how it uses OpenStreetMap data. I started by giving a brief overview of the site, the functionality offered and how we integrate with many other services. I then went on to describe mapme.at as a “Social Location Experimentation Platform”. My idea behind this concept is that mapme.at gives people many ways to experiment with their location. On the one hand it allows regular users to experiment by trying out various services that become available. As an example, someone might decide to try Google Latitude out, perhaps as they’ve just got a new android phone. After a few weeks this person might decide that latitude isn’t offering what they want, perhaps they prefer the badges and mayorships of Foursquare. If they’ve signed up to mapme.at they can store all of their locations in our database where they will be available to the user to download or use in the future. In this way users can experiment without having to think “there’s no point trying this service out as I’ll just stop using it after a few weeks”. The other type of experimentation is developers experimentation. Developers can use our API to experiment and produce all sorts of great apps. I mentioned the ferry trackers as an interesting example of putting data in, and then the “Weasley” clock as a fun example of pulling data out. I also discussed some new functionality that we’re hoping to launch soon. Currently though we use OpenStreetMap as our canonical source of place data, there’s actually three sources that places might come from. If you’ve been using OpenStreetMap since before we launched the places functionality you may have added favourites for places you went to. Many of these favourites are public places that are now covered by the OpenStreetMap places. Part of the new functionality will allow you to merge your old favourites with the OpenStreetMap places meaning you’ll have a single set of logs all attached to the same place. If you’re using Foursquare you may have noticed that we do try to match their “venues” onto our places. Sometimes this isn’t possible though and if you’re using both mapme.at and Foursquare to check in you’ll sometimes find you’re logged at two separate places. The second part of the new functionality will allow you to manually match Foursquare venues onto our places so again you end up with all your logs attached to a single place. The result of this piece of functionality should be a big database of mappings between Foursquare venue IDs and mapme.at place IDs, and by extension OpenStreetMap IDs. We fully intend to release this data when it becomes available and we think this will be a good useful dataset for many people. View more presentations from johnmckerrell. 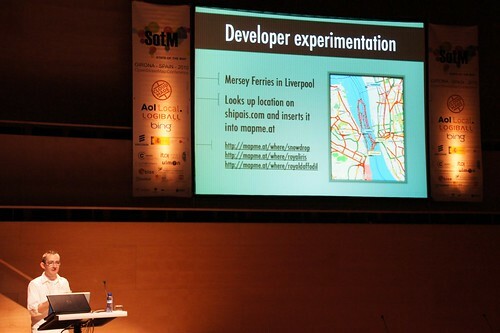 If the talk sounds interesting you can find my slides on slideshare or see them above. I believe all the talks were recorded too so videos should go live eventually. I’ll finish off by thanking the people who organised the conference. It really is one of the best conferences covering location and all things geo and they really did a good job of pulling everything together. The only thing left is to ask where will State of the Map 2011 be? !